See the attached screenshot. Says it all. Anybody have some magic for me, or should I report it as a bug? I just tried again, and this is still a problem for me. what do you want to find with this pattern? I guess, extensions methods, right? You could add some details, which help pattern parser understand what do you mean. 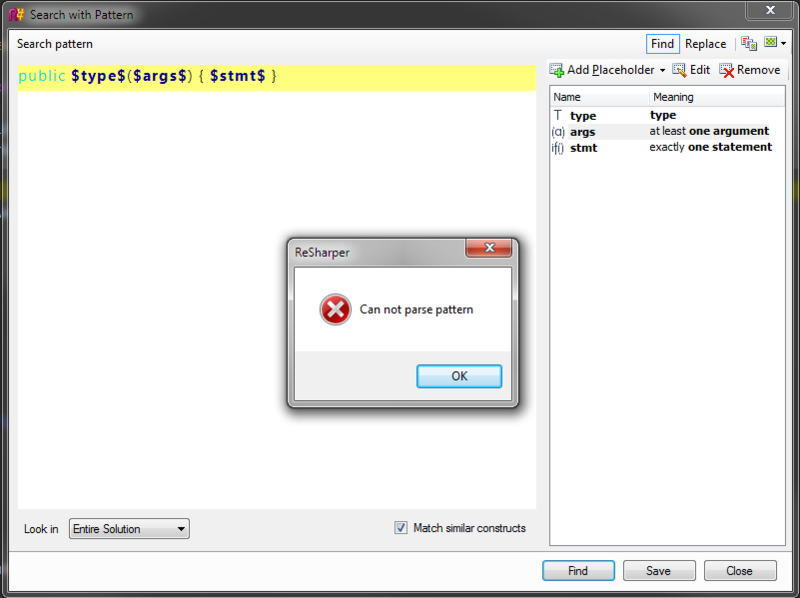 Such pattern in 5.1 will find all methods with single parameter, but it's fixed now in 6.0. Thank you for the improved syntax, that's working well. Based on your comment, it's the "$exp$" expression that is causing the error in my syntax, yes? Yes. In that position only type references are allowed, not expressions. Searching for type members is not yet fully supported in ReSharper 5, there will be improvements in this area in version 6. Okay, so it's another, more general instance of your previous answer - I suspected as much, which is why I added to this thread.